Compatible Notebooks: For Dell Latitude E6430 E6530 E6330. 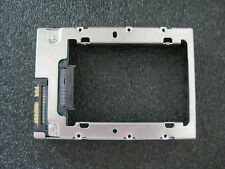 Compatible Model/s : For Dell Latitude E6430 E6530 E6330. 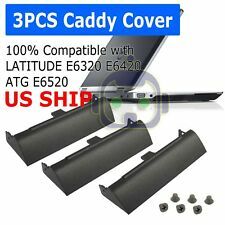 100x Black Hard Drive Door Caddy Cover for Dell Latitude E6320 E6420 E6520 ATG. 10x Hard Drive Caddy Cover Screw FOR DELL Latitude E6220 E6320 E6420 ATG E6520. This caddy accepts 2.5" SATA (Serial ATA) HDD only. Simply pull out your CD/DVD drive and replace it with our optical bay hard drive caddy. Simply remove your CD/DVD-ROM drive and put the Caddy (with the added hard drive) in its place. Item Features: 1 Best replacement for your cracked/damaged/faulted Caddy Cover; 2 Plug and play, easy to use; 3 Reliable quality, easy to use; 4 Fast & Reliable connection in laptop, just as the primary HDD Compatible Notebooks:Dell Latitude E6320 E6420 E6520 Item Specification : *Hard Drive Caddy Dimension: 2.87 x 0.94 x 0.51" / 7.3 x 2.4 x 1.3 cm (L x W x H); *Color: Black; *Material: Plastic *Compatible with Dell Latitude E6320 E6420 E6520 *Condition: Brand New . LOT OF 20 NEW DELL LATITUDE E6400 E6410 PRECISION M2400 LAPTOP HARD DRIVE CADDY. E6400, E6410, M2400. Give us a chance to make things right for you, and we will do our best to provide a fitting solution. ★ Compatible Model: ZBOOK 15 17. 4 x SCREWS. Give us a chance to make things right for you, and we will do our best to provide a fitting solution. Perfect fit for Dell Latitude E6320 E6420 ATG E6520 Laptop. - 3x Harddrive Caddy Cover. This can only delay our service. You will be pleasantly surprised by our service. Four (4) M3 2.5" drive screws and four (4) 6/32 3.5" drive screws will be included. Dell E6420 E6520 E6320 E6430 E6530 E6330. Laptop Hard Drive Cover Caddy. This Serial ATA Hard Drive Adapter lets you add a second hard drive to the laptop systems. Add this caddy to your laptop to give you another hard drive. Any other accessories like Mounting Bracket or ejector latch will not included. 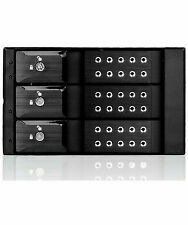 The 2nd Hard Disk Drive Optical bay Caddy / Adapter to bring you new maximum data storage flexibility. With the second HDD/SSD in your Laptop to swap optical drive, You can speed to backup important applications and critical data ( Simply remove your CD-ROM drive and put the Caddy (with the added hard drive) in its place;. ). Compatible : Dell Latitude E6440. Dell Latitude E6440. Dell Latitude E6440 first before placing your order. 10 x HDD Hard Drive Cover Caddy IBM/Lenovo Thinkpad T420s T420si T430s W/ Screws. 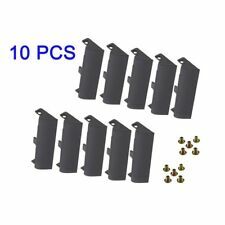 10pcs Hard Drive Cover Caddy Screws. 1 x 5.25" to 3.5" 2.5" SSD HDD Hard Drive Tray. Hard drive cooling fan mounting screw holes. Hard disk rack mounting screw holes. Effectively enhance the machine speed and extend drive life. when you install a fan, it will account more than a optical drive. E6400, E6410, M2400. Give us a chance to make things right for you, and we will do our best to provide a fitting solution. (3)DELL E5430 caddy PN:0FXMRV. - DELL Caddy Replace with DELL 0FXMRV. (2)DELL E5430 and E5530 are not compatible with each other. - Compatible Model: Dell Latitude E5430 E5430. Laptop Hard Drive Cover Caddy. Dell Latitude E5420 E5520;. 1 x Hard Drive Caddy;. Compatible Model: Dell Latitude E6330 E6430 E6530. Laptop Hard Drive Cover Caddy. Laptop Keyboard. Laptop Power Jack Board. 2 x Rubber Rails. Laptop Fan. 1 x Hard Drive Cover. 2 x Screws. Lenovo ThinkPad T400 T500. Laptop Hard Drive Cover Caddy. Server Parts & HDD Caddy/Tray. Simply pull out your CD/DVD drive and replace it with our optical bay hard drive caddy. This caddy accepts 2.5" SATA (Serial ATA) HDD only. HDD Hard Drive Caddy Cover for Dell Latitude E6430 E6530 E6330. - perfect fit for Dell Latitude E6430 E6530 E6330 Laptop. - 3x Harddrive Caddy Cover. - 6x Screws. This can only delay our service. You will be pleasantly surprised by our service. HP Proliant Gen8 servers BL420c Gen8. BL460c Gen8. BL465c Gen8. BL660c Gen8. WS460c Gen8 Blade Workstation. DL160 Gen8. DL320e Gen8. Trending at $8.49eBay determines this price through a machine learned model of the product's sale prices within the last 90 days. HP Z220 Z420 Z620 Z820. HP Work Station require 3.5" Caddy, but you have 2.5" Hard Drive, So you need our this converter to change your 3.5" Caddy to 2.5" Caddy. 1 Converter. Works with the following 3.5" HP drive trays. Lenovo ThinkPad T420 T520 W520 T420i. 2ND Hard Disk Drive HDD caddy/adapter for any uses 12.7mm height DVD drive with SATA connector to the motherboard. It work with SATA hard drive, and SSD (Solid State Drive) as well. Compati ble with: HP 9470M 9480M. - You will receive: 1 x Hard Drive Caddy. 1 x Hard Drive Connector. New Dell Latitude E6330 E6430 E6530 Hard Drive Caddy Cover 7mm Rubber Rails. Dell Latitude E6330 E6430 E6530. Compatible Model:Dell Latitude E6330 E6430 E6530. 2 x Rubber Rails. 1 x Hard Drive Cover. E6320 E6420 E6520. Give us a chance to make things right for you, and we will do our best to provide a fitting solution. New Hard Drive Caddy Cover 7mm Isolation Rubber Rails for Dell Latitude E6440. Compatible Model: Dell Latitude E6440. 2 x Rubber Rails. 1 x Hard Drive Cover. Give us a chance to make things right for you, and we will do our best to provide a fitting solution. HP ProLiant DL 380E G8. HP ProLiant BL420c G8. HP ProLiant DL 388 G8. HP ProLiant BL460c G8. HP ProLiant DL 560 G8. HP ProLiant BL465c G8. HP ProLiant BL 660c G8. Compatible Drive Type:2.5" SATA or SAS HDD SSD. HP EliteBook Folio 9480M. Compatible Model: HP EliteBook Folio 9470M. HP EliteBook Folio 9460M. Laptop Keyboard. Laptop Power Jack Board. Laptop Fan. Laptop Hard Drive Cover Caddy. You will receive: 1 x HQ Hard Drive Connector. For Dell Latitude E6230/6230. 1 x Hard Drive Connector. This is our SOP, for us to be certain and for record purposes. 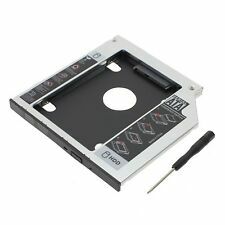 Universal Optical bay 2nd HDD Hard Drive Caddy SATA 9.5mm for Apple Macbook Pro. This caddy accepts 2.5" SATA (Serial ATA) HDD only. Simply pull out your CD/DVD drive and replace it with our optical bay hard drive caddy. Lenovo ThinkPad T440p T540p W540. Laptop Hard Drive Cover Caddy. Server Parts & HDD Caddy/Tray. Simply pull out your CD/DVD drive and replace it with our optical bay hard drive caddy. This caddy accepts 2.5" SATA (Serial ATA) HDD only. Dell Latitude E5530 E5530 Hard Dive HDD caddy bracket 0DGJ8M. Dell Latitude E5530 E5530. 1 X DELL CADDY. We might require you to send us photo/s of the item received and also your original item so we can compare and conduct necessary actions. DELL Latitude E6400 E6500 E6410 E6510 M2400 M4400 M4500. Swapping the Ejector and faceplate from your original DVD Drive maybe required. Laptop Hard Drive Cover Caddy. Server Parts & HDD Caddy/Tray. Laptop Keyboard. Laptop Hard Drive Cover Caddy. Server Parts & HDD Caddy/Tray. Laptop Keyboard. Simply pull out your CD/DVD drive and replace it with our optical bay hard drive caddy. This caddy accepts 2.5" SATA (Serial ATA) HDD only. Prodesk EliteDesk G1 G2. FOR MODELS WITH 2.5" BAY HDD or SSD, WILL NOT WORK WITH BAY 3.5" desktop HDD. HP 600 800 G1 SFF. 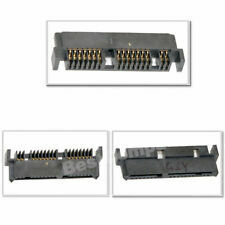 For DC5800, DC7800, DC7900, Elite 6000, 7900, 8000, 8100, 8200, 8300, Z200, Z400. Compatible Notebooks: For Dell Latitude E6440. Compatible Model/s : Dell Latitude E6440. Country/Region of Manufacture : China. Qty : 10 pieces with screws. And this area is the details contents of your policies. Lenovo ThinkPad W510 W530. 2ND Hard Disk Drive HDD caddy/adapter for any uses 12.7mm height DVD drive with SATA connector to the motherboard. It work with SATA hard drive, and SSD (Solid State Drive) as well. Compatible Models: Dell E4310. This hard drive cover is an important accessory for your beloved laptop. Overall, this fabulous item will exceed your expectation! Interface: IDE Hard Drive Cover. Type: Hard Drive Cover. New Genuine Dell Latitude E5480 cable connector 80RK8 caddy 0NDT6. Laptop Hard Drive Cover Caddy. Server Parts & HDD Caddy/Tray. Dell Latitude 5480 E5480. Independent graphics Card version has no SATA slot, can not install the HDD & can only installSSD kit. Laptop Hard Drive Cover Caddy. 1x Hard Drive Caddy (7mm). Laptop Keyboard. 2x Hard Drive Rails (7mm). Laptop Power Jack Board. Laptop Fan. 1x Hard Drive Cover. new arrival. For Dell E6220 6220. 1 x Hard Drive Connector. This is our SOP, for us to be certain and for record purposes. NEW 9.5 mm SATA TO SATA 2ND HDD HARD DRIVE CADDY. HDD INTERFACE: SATA (2.5" SATA and SSD drives). CADDY THICKNESS: 9.5 mm. LAPTOP/MOTHERBOARD INTERFACE: SATA. No exception. LOT OF 30 NEW DELL LATITUDE E6400 E6410 PRECISION M2400 LAPTOP HARD DRIVE CADDY. E6400, E6410, M2400. Give us a chance to make things right for you, and we will do our best to provide a fitting solution. Compatibility It is compatible with MACBOOK MACBOOK PRO that has a 9.5mm-high unibody SuperDrive with SATA interface. Compatible with : Unibody MacBook: MB466LL/A, MB467LL/A, MB881LL/A. 2.5"/ 9.5mm SATA 2nd hard drive caddy tray. E6500, M4400. It is a direct fit into any Dell Latitude E6500 laptop, and is sure to give you the results you want. Size: fits Dell E6500. 1 x HDD Caddy Cover for Dell E6500. Color: Black. High-quality components ensure top notch performance. Compatible with: Dell Latitude E5470. - opens in a new window or tab. Compatible Model : Dell Latitude E6220 E6230 E6420. Laptop Keyboard. Laptop Power Jack Board. Laptop Fan. Laptop Hard Drive Cover Caddy. You will receive: One HQ connector with three months Warranty. Compatible with: Dell E6420. Dell E6420. HARD DRIVE CADDY COVER. LED Fog Light. ◈ 250 Labels per Roll. ◈ 450 Labels per Roll. Compatible Models : For Dell Latitude E6430 E6530 E6330pply. 10pcs Hard Drive Cover Caddy.